Recent studies done at USDA Agricultural Research Stations in Idaho indicate that pm harvested hay had greater concentrations of mono- and disaccharides (sugars), greater total nonstructural carbohydrates, and tended to have lower concentrations of both neutral detergent fiber and acid detergent fiber. In a production test, lactating dairy cows preferred p.m.-harvested hay more than a.m. harvested hay, had greater intake levels, and produced more milk (Mayland, 2000). It is not known if these same results would occur in the Midwest. If the same response occurs in the Midwest, this could be very important to dairy producers and profitability. However, differing environments, especially with regard to drying conditions, may cause this response of increased sugar content not to occur in the Midwest. 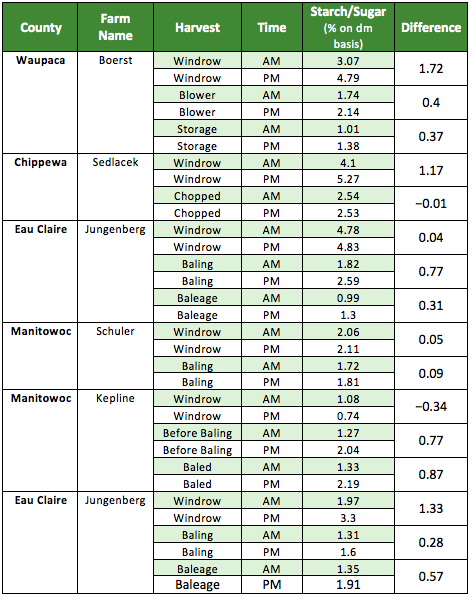 The Wisconsin Forage Council and UW-Extension Team Forage studied the effect of a.m. vs. p.m. cutting to see if there is a difference in sugar/starch content between these two cuttings in Wisconsin. A protocol was developed for Wisconsin Forage Council members and UW-Extension agricultural agents to follow to gather samples. Morning cutting and harvest were targeted between 9:00 am and 10:00 am. Afternoon cutting and harvest were targeted between 4:00 pm and 5:00pm. Stored harvested samples were targeted to be taken any time after four weeks of harvest. Wisconsin Forage Council members collected information with the help of county UW-Extension Agricultural Agents. Five farms from four counties participated in the study. UW-Extension Team Forage paid for the research analytical fees for this study. All samples were analyzed for DM, CP, ADF, and NDF. Analysis of the data showed a difference in the starch/sugar content of the a.m. harvested hay and the p.m. harvested hay. 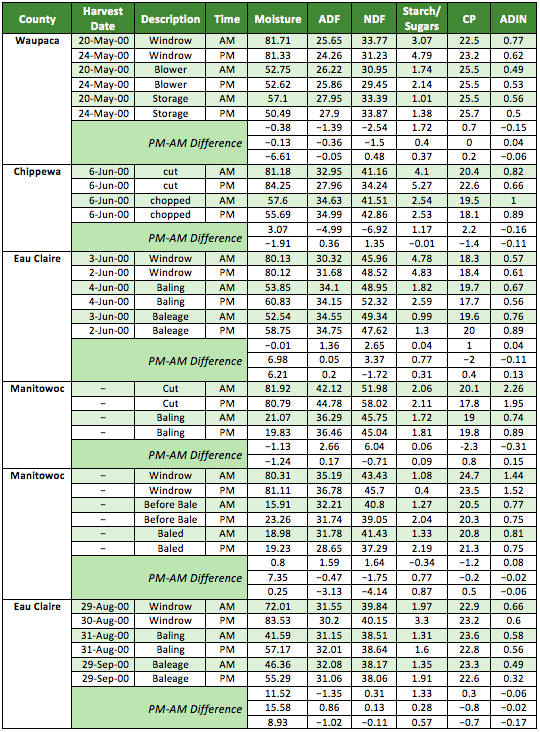 Table 1 displays the p.m.-a.m. difference in the starch/sugar content of the farms involved with the study. In 5 of the 6 farms sampled, the afternoon cutting did show a higher level of starch/sugar during cutting. In these 5 farms the level of difference between p.m. and a.m. cutting ranged from 1.72 to 0.04 percent starch/sugars on dry matter basis. The higher starch/sugar concentrations were retained in the p.m.-harvested forage through the storage stage. At cutting, 3 of the 6 p.m. samples were lower in ADF, 2 samples were lower in NDF and 4 were higher in CP. Samples taken at harvest indicated that 2 of the 6 p.m. samples were lower in ADF, half were lower in NDF and 2 of the 6 were higher in CP. Of the 4 samples that were taken out of storage, 3 were lower in ADF and NDF and 3 were higher in crude protein. Data from the study at Idaho consistently indicated a lower ADF and NDF and higher mono-and disaccharides during the p.m. cuttings over three months of harvest. Based on the low number of samples submitted for this study, no recommendations or conclusions can be drawn relative to starch/sugar concentrations. However, in order achieve statistical reliability, larger number of cooperating farms and samples will be needed. It is recommended the Wisconsin Forage Council continue this project. H.F. Mayland, USDA-ARS, Wisconsin Forage Council 24th Forage Production and Use Symposium Proceedings, January 25 and 26, 2000, pp. 30-33.